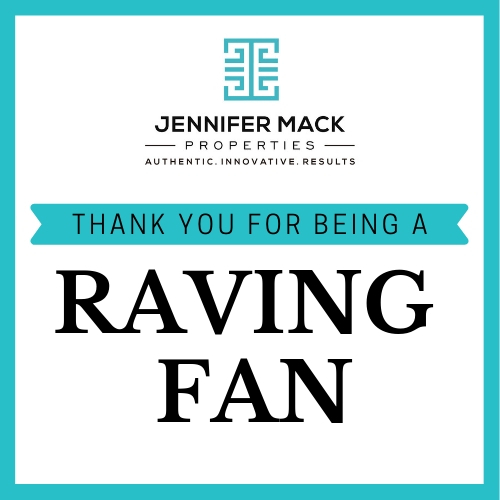 At Jennifer Mack Properties we love to reward those who have helped us build our business to the successful real estate team it is today. You can take advantage of this rewards program by becoming a Raving Fan! All you have to do is introduce us to someone that is looking to buy or sell a home in the next 6-12 months. You can introduce us by email or text, or simply send us the person’s information. We do the rest, and you become part of our exclusive group of Raving Fans! Once a quarter you will receive a BLACK box at your front door! Inside the box is a special curated gift picked especially for you by the JMP team. At the end of the year we will celebrate all our Raving Fans with a special event in your honor! Think VIP dinner, Brewery Tours, and more!